It is unclear if Dante had in mind a particular historical or fictional model for the beautiful young woman who appears in the forest at the top of the mountain and guides Dante (with Statius) through ritual bathings in the rivers Lethe and Eunoe. Dante draws comparisons between Matelda and the classical goddesses Proserpina (Persephone) and Venus (28.49-51, 64-6) as well as (indirectly) the pagan priestess Hero (28.70-4), and Matelda also bears resemblance to the virginal figure of justice (Astraea) during the Golden Age. Some commentators have identified her with famous women of the same name, such as the Countess Matilde of Canossa (1046-1115), the mystic Mechtildis of Hackeborn (d. 1298), and St. Mechtildis of Magdeburg (1207-82). Dante's Matelda, whose name is withheld until Beatrice refers to her in 33.118-19, embodies the pure beauty and innocence of this terrestrial paradise, which was the home of Adam and Eve before they disobeyed God and were cast out. Matelda sings as she gathers colorful flowers, like Leah of the dream, and she moves like a graceful dancer as she approaches the bank of the river across from where Dante observes her. Her shining eyes and dazzling smile are almost too much for Dante to bear. Looking across the river in the Terrestrial Paradise, Dante witnesses a spectacular pageant of religious imagery, much of it based on Ezekiel and the Apocalypse (Revelation) in the Bible. He first sees seven tall, golden candles leaving behind a rainbow trail of colors (29.43-54, 73-8). Representing the sevenfold spirit of God or the seven gifts of the Holy Spirit (wisdom, understanding, counsel, might, knowledge, piety, fear of the Lord), these candles lead the procession of biblical figures and symbols: twenty-four mature men (64-6, 82-4), two by two, dressed in pure white and wearing crowns of lilies (books of the Hebrew Bible); four animals (92-6), each with six wings (full of eyes) and wearing a leafy-green crown (the Gospels); a two-wheeled chariot pulled by a Griffin (106-20); three dancing women--colored fire-red, emerald-green, and snow-white--at the right wheel of the chariot, and four dancing women (one with three eyes), in crimson-colored garments, at the left wheel (theological and cardinal virtues) (121-32); seven more men dressed in white but wearing crowns of roses and other red flowers (133-50), including two old men, one with the bearing of a physician (Luke: Acts of the Apostles) and the other carrying a sword (Paul: Epistles), four men of humble appearance (James, Peter, John, Jude: short epistles), and a single old man with sharp features even as he sleeps (John: Apocalypse). The Griffin is a hybrid creature with the features of an eagle (wings and head) and a lion (body). Griffins were depicted in ancient Egyptian art (the myth is likely eastern in origin), and, as actual creatures, were thought to live at the northern limits of the world. They are included among unclean birds in the Bible (Lev. 11:13; Deut. 14:12), and Isidore of Seville, an early medieval encyclopedist, says Griffins are "fierce enemies of horses" and, he adds, they "tear men to pieces" (Etymologiae 12.2.17). Dante's Griffin pulls a gorgeous two-wheeled chariot bearing Beatrice at the end of the elaborate procession in the terrestrial paradise. The chariot is yoked to the neck of the Griffin, whose wings (stretching high out of sight) and other aquiline features are gold in color, while his hind quarters are a mixture of white and deep red. Of multiple symbolic meanings that may be attached to this Griffin, its Christ-like role--"one person in two natures" (31.81)--is the most obvious. Dante dramatizes this incarnational symbolism when he has the Griffin's image, reflected in Beatrice's eyes, miraculously alternate between a complete eagle and a complete lion, while the creature itself remains fixed in its hybrid form (31.118-26). Beatrice appears before Dante in the chariot drawn by the Griffin in the Terrestrial Paradise. Since the journey takes place in the year 1300, Dante last saw her ten years ago: she died in 1290 at age 24. We know little of Beatrice's life outside her presence in Dante's Vita Nuova and Divine Comedy. Early commentators identify her as the daughter of Folco Portinari, a leading Florentine citizen, and the wife of Simone dei Bardi, who belonged to one of the city's major banking families. Beatrice came down from Heaven to Limbo, Virgil told Dante before they set out on the journey (Inf. 2.52-126), as one of "three blessed women" who intervened on Dante's behalf. Beatrice will guide Dante in various ways for nearly the rest of his journey, but she initially takes a harsh approach (she is compared to an admiral in 30.58-66) as the judge of Dante's past transgressions. Her appearance in this biblical location, the site of humankind's fall from innocence, contains multiple layers of symbolism. Donning the colors of the three holy virtues (white veil for faith, green cape for hope, and red dress for love: 30.31-3), Beatrice is greeted by her angelic companions with words echoing those used to announce Jesus' arrival in Jerusalem (30.19). After extracting a painful confession from Dante (31.31-90), she presides over an allegorical display of providential history and finally offers an enigmatic prophecy of future salvation (33.40-5). Beatrice commands Dante to observe and report what happens to the chariot, which is a dramatic allegory of Christian history. An eagle (Roman empire) swoops down through the flowering tree and strikes the chariot (Roman persecution of the early Church); a fox (heresies) leaps into the chariot, before being chased away by Beatrice; the imperial eagle again attacks the chariot, this time leaving behind feathers (the Donation of Constantine, viewed as worldly contamination of the Church); now a dragon (Islam, viewed as a schism within Christianity) rips through the bottom of the chariot and carries away a part of it; what's left of the chariot sprouts seven monstrous heads (like the beast of the apocalypse), three at the front with oxen horns and four single-horned creatures at the corners; then, seated in the chariot appears a loosely clad prostitute (the corrupt papacy) who lasciviously embraces a giant standing next to her (the French monarchy); the giant brutally beats the wanton woman (Philip the Fair's hostile treatment of Pope Boniface VIII) and finally drags the chariot and woman into the forest (Pope Clement V's removal of the papacy from Rome to Avignon in southern France). Dante poignantly bids farewell to his guide, mentor, and friend by having him fade away from view, not only physically but textually as well. The final two images of Virgil, like snapshots in a photo album, portray him as smiling in the first case (28.145-7) and showing amazement in the second (29.55-7). When Dante next turns to see Virgil, he is no longer there, much to Dante's understandable dismay (30.43-54). While we don't actually see Virgil leave the stage, his disappearance from the action of the poem is marked, appropriately enough, by a loving tribute to the Roman poet based on his own verses: Dante first cites Virgil's original Latin ("manibus date lilia plenis" [give lilies with full hands]: Aen. 6.883; Purg. 30.21); he then translates Virgil's verse from Latin to Italian ("agnosco veteris vestigia flammae" / "conosco i segni de l'antica fiamma" [I recognize the signs of the old flame]: Aen. 4.23; Purg. 30.48); finally, Dante echoes Virgil's Georgics 4.525-7, which records Orpheus' three-fold repetition of Eurydice's name, with his own cry of "Virgilio - Virgilio - Virgilio" upon realizing the loss of his beloved guide (Purg. 30.49-51). 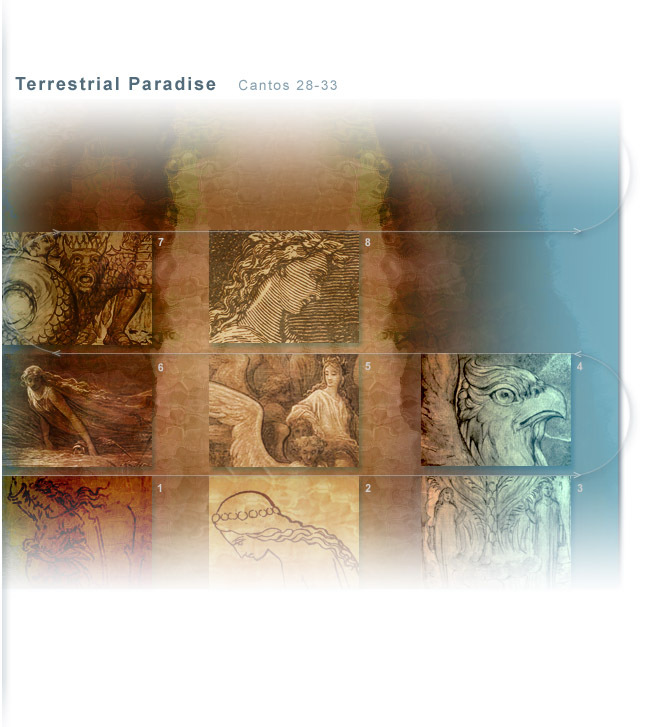 Matelda explains to Dante that the water flowing through the terrestrial paradise derives from a single, divine source but moves in two directions, thus forming the river Lethe to one side (left) and the river Eunoe to the other (right) (28.121-33). Dante, however, later needs to be reminded of this when he thinks the parting rivers are the Tigris and Euphrates, which flow through Eden in the account of Genesis 2:10 (33.112-23). For the river Lethe, Dante draws on the classical tradition, according to which souls of the dead drink Lethe's waters to forget their previous life before passing into a new earthly existence. Lethe's role in this process of "transmigration" (or metempsychosis) appears, for instance, in Virgil's Aeneid (6.713-15). Dante now modifies this conception by limiting Lethe's power (to only the oblivion of guilty memories of sin), the efficacy of which is seen in his own immersion and subsequent forgetfulness (31.91-102; 33.91-9). To complement these Lethean powers of oblivion, Dante invents the river (and word) Eunoe, which means "good memory" in Greek (eu = good; nous = mind): specifically, the recollection of good deeds. After he has tasted the waters, first of Lethe and then of Eunoe, Dante is "cleansed and ready to rise to the stars" (33.145) (audio). Various explanations have been given for this enigmatic prophecy of a "five hundred and ten and five" sent by God to slay the prostitute and giant. One method involves changing the Hindu-Arabic number (515) to its Roman equivalent (500=D, 10=X, 5=V). By reversing the order of the last two letters, we then obtain the Latin word DUX (u and v are the same), meaning "leader" in a political-military sense. Specific candidates for the prophesied savior include the emperor Henry VII and Can Grande della Scala, two men in whom Dante placed great hope for effective secular leadership. Can Grande ("big dog") has also been posited as a solution to the greyhound prophecy announced by Virgil in the dark wood. Others argue that Dante intended the Roman letters DXV to indicate, in reverse, a well known abbreviation for a prayer: the initial letters of the opening Latin words (V from Vere; D from dignum) were joined with a horizontal line passing through the center, thus producing a small cross-like X between the V and D. This figure was sometimes interpreted in the Middle Ages as a symbol of Christ's union of divine and human natures (D = Dio = "God"; V = U = Uomo = "Man"). Some commentators use the kabalistic technique of gematria, based on the assignment of numerical values to letters of the Hebrew alphabet, to solve Dante's riddle: the number 515 could produce a version of Henry VII's name ("Arrico") or a word whose sound might suggest the blast of the angel Gabriel's trumpet at the Last Judgment. Still others, based on some version of these various methods, believe the prophecy refers to a future pope, a specific date (e.g., 1315, five hundred and fifteen years after the coronation of Charlemagne), or even to Dante himself. 1. Consider Virgil's sudden departure immediately upon the arrival of a very stern Beatrice (cantos 30-1). What does this "changing of the guide" say about Dante's relationship to Virgil? To Beatrice? 2. A procession of biblical symbols and a dramatic display of providential history are presented in cantos 29 and 32. Why is it necessary for Dante (and, by implication, the reader) to witness these scenes at this location in the journey / poem? 3. Consider the function of the rivers Lethe and Eunoe: why must the souls be made to forget their sins and recall their virtuous acts before ascending to Paradise? 4. Explain Dante's statement that he must conclude the Purgatorio because he has completed a predetermined number of pages (33.136-41)? What does this passage tell us about Dante's overall conception of his poem? Although Dante's answers may not be our answers (at times, they assuredly are not! ), significant issues raised in the Purgatorio continue to be important in the world today. Examples might include: responsibilities and rights of individuals, leaders, and society; effects of misrule; church-state relations; criminal justice (punishment and rehabilitation); love and sexuality; artistic expression and censorship. Think of a recent event or issue that provides an interesting parallel or contrast with Dante's way of thinking.